Today is International Talk Like a Pirate Day. As well as the Jewish holiday of Yom Kippur. What would be an appropriate topic, albeit perhaps a little afield from the subject of genealogy, for a blog post combining the two? 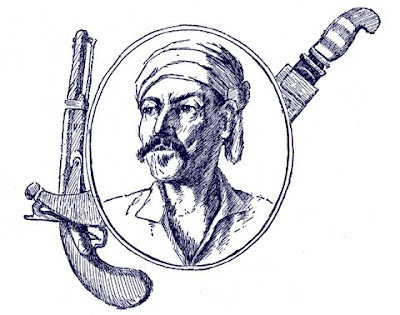 How about Jean Lafitte, the possibly Jewish Pirate? The facts of his origins, and those of his demise as well, depend upon whether you believe the "Journal of Jean Lafitte" is a forgery or not. Discovered in the possession of a claimed descendant. As a St. Louisan, this last definitely interests me. Though I have been unable to determine where John Lafflin (whether or not in reality Jean Lafitte) is supposed to be buried. Mysteries tend to surround pirates, don't they? However, while the origins of Jean Lafitte are controversial, in Jewish Pirates of the Caribbean, author Edward Kritzler makes the claim for several others. Some of the earlier ones are said to have gone into the piracy business as revenge against the inquisition. Of course, pirates tend to break a few commandments in their daily routine. Ends rarely justify the means, and revenge isn't generally considered a morally appropriate explanation for deeds. One wonders if the above Jewish pirates recited the Al Chet (confession of sins) yearly on Yom Kippur.